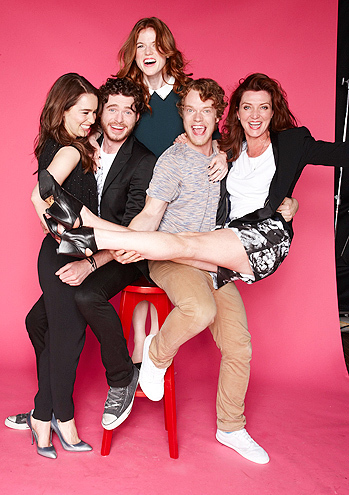 Emilia Clarke, Richard Madden, Rose Leslie, Alfie Allen & Michelle Fairley. . Wallpaper and background images in the गेम ऑफ थ्रोन्स club tagged: game of thrones comic-con 2012 emilia clarke richard madden rose leslie alfie allen michelle fairley. This गेम ऑफ थ्रोन्स photo contains नंगे पैर, pantyhose, चिपटनेवाला पैंट, चिपटनेवाला, पेंटीहॉस, स्किन्टाइट पैंट, स्किन्टाइट, skintight पैंट, skintight, hip boot, thigh boot, अच्छी तरह से तैयार व्यक्ति, सूट, पैंट सूट, pantsuit, पैंट्सट, and अच्छी तरह से कपड़े पहने व्यक्ति. There might also be होजरी, नली, बिजनेस सूट, चड्डी, and leotards.